There are many uses that we have for the Internet. You can use the Internet for setting up your own e-commerce store, communicating via email and VoIP among other things. However, there’s no denying that downloading files over the Internet is a primary thing done by almost every Internet user. This means that more data is being transferred than ever before. With the advancement of 3G and 4G mobile phone technologies, this allows even more usage of the Internet via smartphones and other gadgets. There are plenty of downloading manager softwares that can help make the downloading process more efficient, managed and fast. 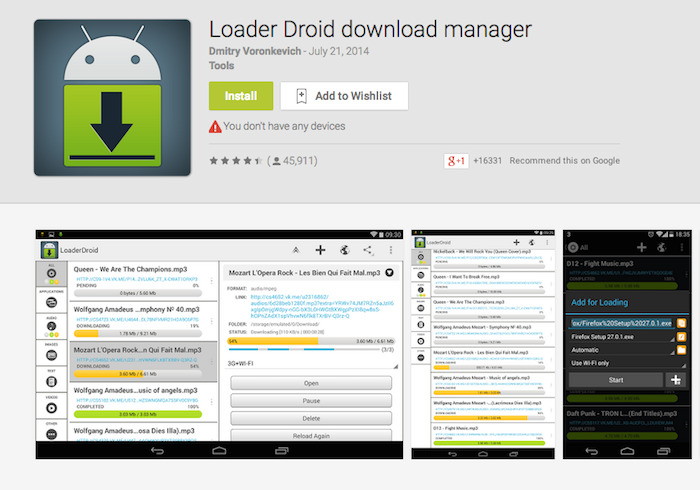 In this post, we have put together 5 file downloading managers designed for Android devices. Take a look to see what fits your needs. Advanced Download Manager is a simple yet powerful application to speed up the downloading process with up to 3 simultaneous files. Apart from this, you can also resume the download of a file and save files of different types in different folders. You can also backup your list of downloaded files and much more by using Advanced Download Manager. 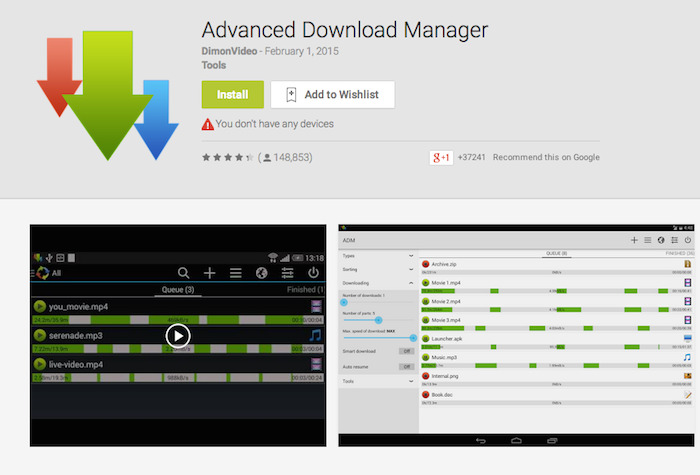 Download Manager for Android can be used to download any type of file up to 3 times faster than the normal speed. Other noticeable features includes the ability to download files with an unknown format and unknown size, the capability to resume interrupted downloads, speed indication via downloading progress bar and so on. It also has a built-in media player to play the downloaded files. 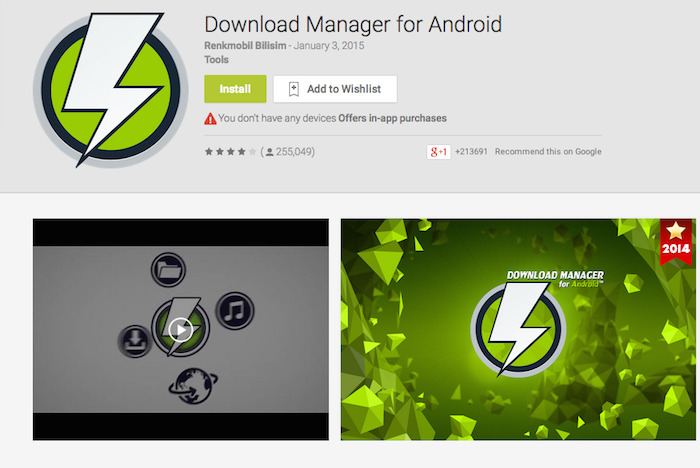 Loader Droid Download Manager is a small sized application which can download any file with any format easily and efficiently. It offers a user friendly interface which includes a downloading progress bar, a notification bar and different colour themes to choose from. A few of its important features include downloading files faster, pausing and resuming the downloading process automatically once the connection is lost and restored respectively, scheduling downloads and a lot more. 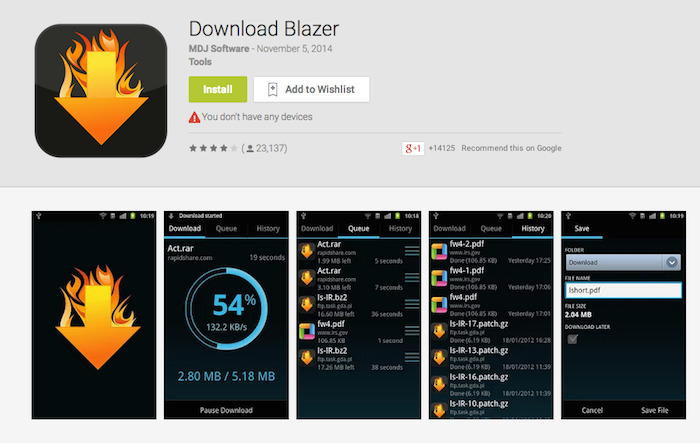 Download Blazer can integrate with almost all browsers (excluding Opera Mini and Opera Mobile). 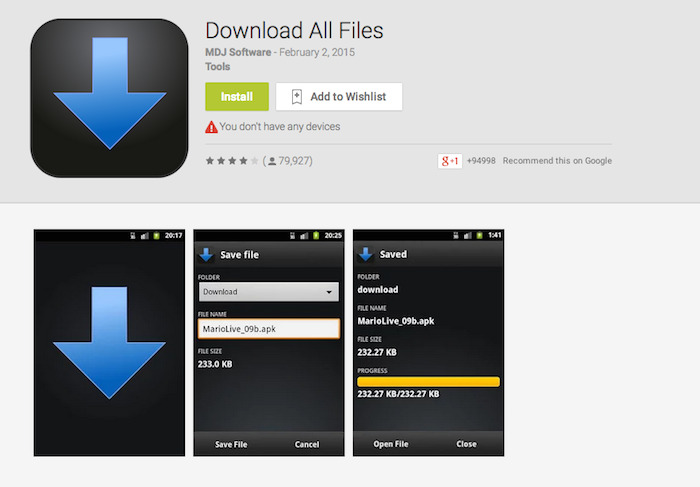 It is a simple app which can download any type of file except YouTube files. Some of its key features are downloading files at fast speed, the ability to paund the ad-free version by paying a sum. Download All Files is a free download manager which has been downloaded 15 million times by users around the globe. The seamless integration of the app with web browser allows one to download almost all formats of files and you can save these files on an SD card easily. You can also download and save all your Gmail attachments without any difficulty. The free version of app is ad-supported while the pro version is ad-free. Due to Google policy, it can not work for streaming videos such as YouTube etc. 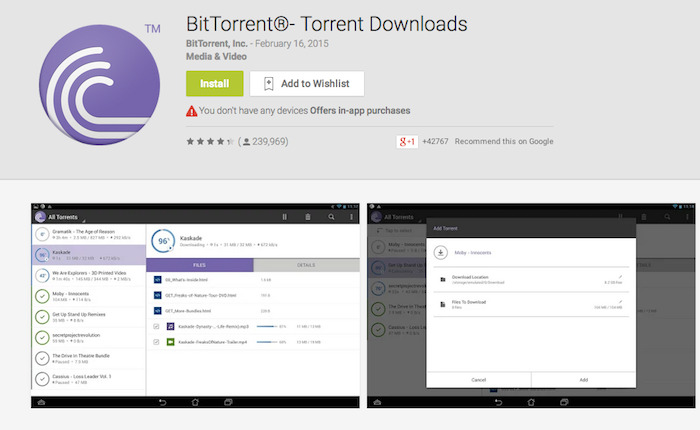 BitTorrent is an official and free App for Android devices to find and download torrent files. It provides a beautiful yet simple and easy to use interface. You can even download selective files from a torrent to minimize the usage of storage and can play these files via integrated media player of BitTorrent. While using the App in WiFi mode, there is no speed and size limit. You can download more than one torrent music file and can download any torrent file with magnet links. You can access the licensed content from BitTorrent’s content partners as well as other handy features.